In what may be the sweetest instance of robot-on-robot kindness we've seen this week, this group of 'Thriller'-dancing robots slows down and waits for one of their number to recover when a researcher makes it fall down. It may not seem revolutionary, but it's more than just heartstring-tugging. It's a demonstration of some quite advanced nonlinear control logic--the same area of research which is behind recent bird, dog, and troodon robots, and indeed the walking humanoid Nao robots used in the video. 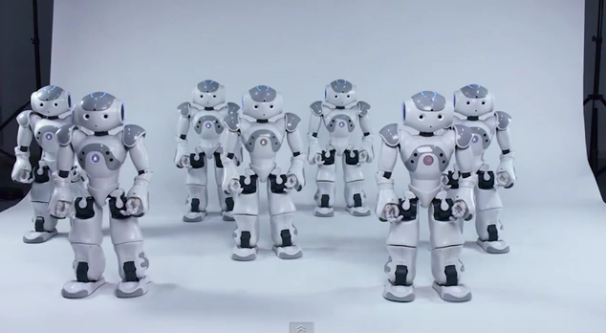 Like a human dance group, the robots constantly stay in sync with each other and with the music (although they're keeping their place in the dance wirelessly rather than visually). When the other robots notice that one has fallen behind, they start dancing more slowly. When the fallen robot stands up, it wirelessly receives a starting position from its fellows -- but it can't get its arms and legs in order immediately, so the other robots are further in the dance by the time it gets going, and so it dances more quickly to catch up. Eventually it gets resynchronized, and the dance goes on at its original speed. Given the existence of all-virtual pop stars and dubstep dance groups, how long will it be before these robots are performing in their own right?